It ‘s just a draft, a starting point to be improved for building new projects. The idea is very simple. Using two photoresistors (LDRs), one pointing slightly to the right and the other slightly to the left, let’s read the values ​​and move a continuous rotation servo in the direction of the photoresistor receiving more light, until the brightness is about the same on both LDRs. As you can see I used Arduino Mini Pro, but nothing change using Arduino UNO. The only difference is that feeding the Arduino Pro Mini I had to use an external regulator, because the inside is not enough to drive the servo. As you see, everything is very simple. 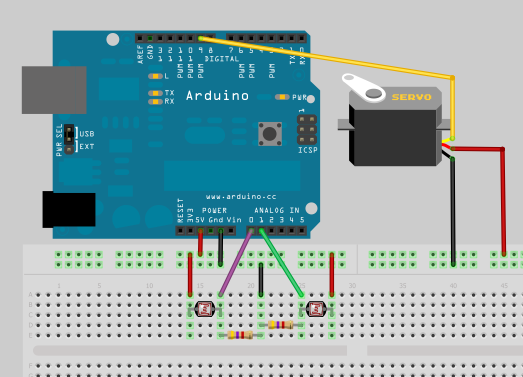 If you want to download the fritzing file, this is the link. while in idle (delay), saving lot of energy. the last staement Narcoleptic.delay(15) with delay(15). The variable Center represents the centering value of the servo. In my case it is 105, while usually it is 90. With this value, the servo must stop running. The speed is directly proportional to the absolute value of "Value"
The code is very simple and self-explanatory, so I will not dwell too much.